Last night Jane, Sara, Stuart and I went to see The Treatment at the Almeida Theatre in London's glitzy Islington. Synopsis: Well produced but ultimately a bit of an exasperating experience. But maybe that was the point. 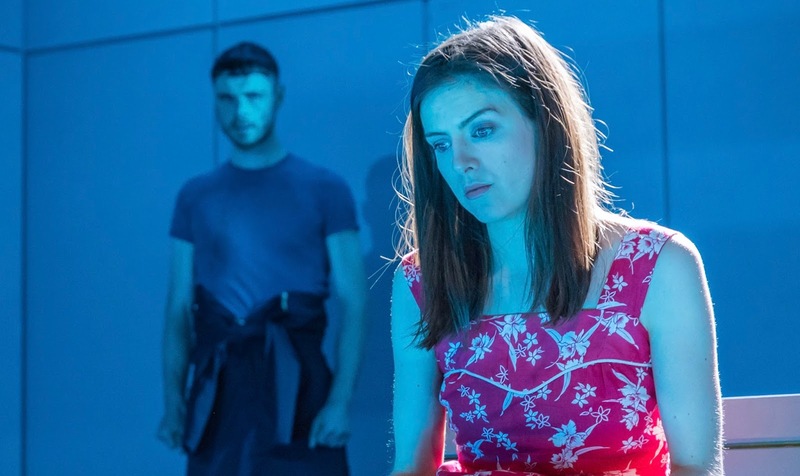 Lyndsey Turner’s immaculate, neon-lit revival of Martin Crimp’s 1993 play lays bare the ways reality is exploited and distorted by the media. 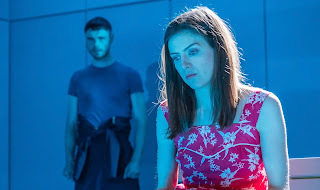 The setting is New York and Crimp plunges us straight into a study of the way two movie types Jennifer (Indira Varma) and Andrew (Julian Ovenden) – who call themselves “facilitators” – appropriate the lived experience of a young woman, Anne (Aisling Loftus). As she graphically describes the way she was bound and gagged by an electrical engineer (Matthew Needham), they become visibly excited by the narrative’s potential. Anne is reminded that “no one’s story is theirs alone”, and we see how she is exploited by the predatory facilitator husband-and-wife team. They first merge her story with a scenario about voyeurism by a clapped-out playwright, and then recruit a big movie star to give the project financial muscle. The staging is great and the acting spot on but boy were the characters frustrating and hard to engage with. They were all just so unlikable - and the humour, whilst good-natured, wasn't savage enough for us to admire their bravado much either. They were complex people sure, but inconsistently so. Rather like real life people I suppose! But who comes to the theatre to see real, unlikable people? Ha, ha. But maybe that was the point of The Treatment. Talking of which, there’s a rich ambiguity to the title of Martin Crimp’s play. It could refer to the movie outline being planned or to the manipulative human behaviour of the facilitors. In fact, both meanings came together in a play that combined satire on the media’s distortion of reality with the nightmarish vision of city life. In the later stages, Crimp pushes his fable beyond the bounds of probability as it moves closer to melodrama and we don't really believe in Andrew's fixation with Anne and the accidental tragedy seems abit tacked on. One rather odd, and particularly gory, moment saw a character who whilst earlier on in the piece promised “to introduce a Shakespearean element” to the movie treatment then later found himself treated as cruelly as Gloucester in King Lear. Geddit?! The standout character in the piece for me was the blind taxi driver who perhaps might have served as an excellent muse to each scene in the story and a better 'way in' to the characters for the audience. The blind leading the blind.. etc... But what do I know? Critics? Cretins! Ha, ha.